I’ve been hearing questions like these a lot lately. Wearable “activity trackers” — not long ago a niche product — are getting more popular, and people are wondering how they work and whether they’re worth it. I decided to wear a bunch of trackers simultaneously for a period of 10 days to really get a sense of their features and, more importantly, their accuracy. The four I’ve been wearing — the Jawbone Up, the Nike+ FuelBand, the Fitbit Flex and the Basis Band — all perform the same basic function: They go on your wrist, they use accelerometers to measure your steps and activity levels throughout the day, and they send that data to an app on your mobile phone. Otherwise, their feature sets vary. So, which band is best for you, and which is the most accurate? Read on. Design-wise, my top pick is the Jawbone Up. It’s cool-looking and simply wraps around the wrist, like a coil bracelet — no clasp or snap needed. The Fitbit Flex gives Up some stiff — or rather, flexible — competition. It’s also made of a soft, comfortable elastomer, although, the band needs to be clasped on the underside of the wrist. The Basis Band is a watch, not a band. 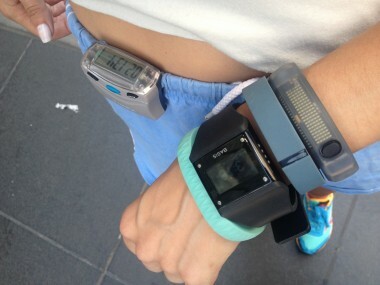 It definitely looks more like a gadget watch than a fashion one, but it’s relatively lightweight. The Nike+ FuelBand is chunky and unbending, and every time I snap it shut on my wrist, I’m afraid I might catch a wad of my flesh in it. Beyond comfort, though, there’s something else to keep in mind: Displays. Both the Nike+ FuelBand and the Basis Band will show you — right on the band — the time of day, the number of steps you’ve taken, and the number of calories you’ve burned. Over time, I grew to appreciate that I could see this data without having to pull out my phone and sync the bands, like the others. 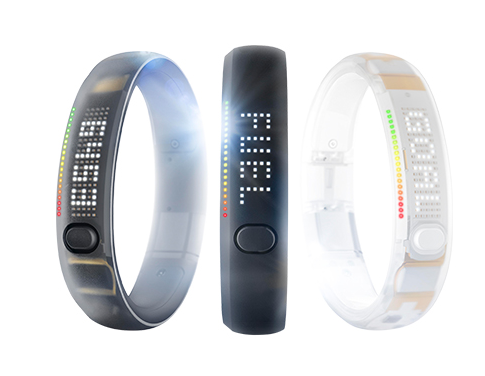 Most of the bands use Bluetooth to wirelessly sync your activity data to your mobile phone. 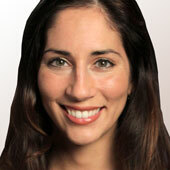 Up is the only one that requires you to attach the band to your phone, via the phone’s audio jack, for syncing. I used to find this strangely satisfying to do once or twice a day to check my progress. 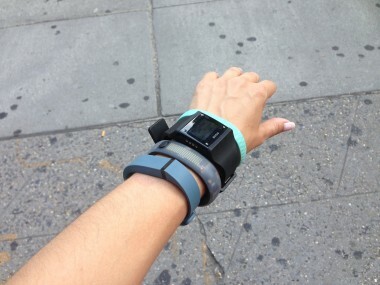 But then the Fitbit Flex’s super-fast wireless syncing sort of blew me away. I don’t want to gloss over the mobile apps, as I feel the compatible apps are a huge part of the activity-tracking experience. They’re where users log their food intake, or link to other mobile apps, such as RunKeeper, to get a more comprehensive look at their daily habits. But accuracy is a key focus of this column, and I want to get to that. I will say this, though, about the apps: I have 17 friends using the Up, nine friends on Fitbit, zero friends using Basis, and a couple of friends on the Nike+ FuelBand app (though I know for a fact that more of my friends are using Nike+ — we’re just not connected through the app). I’ve found that having more friends wearing the same band greatly enhances the overall experience. Also, in my first column about the Nike+ FuelBand, I wrote that Nike “Fuel” — the company’s proprietary currency for measuring your exertion levels (using an algorithm based on oxygen kinetics) — felt sort of arbitrary. After giving the FuelBand and app a second try, I still feel that way. When it comes to accuracy, your hips don’t lie. It’s pretty much universally recognized, even by the creators of these bands, that a standard hip pedometer will give a more accurate measurement of your steps than an activity wristband. Wristbands can register “false positives” — you could, for example, be sitting at your desk but if you wave your arms wildly, the band will read it as activity. Conversely, you could be walking briskly but pushing a stroller and not pumping your arms, which could affect the reading. All of the companies have built their bands with these factors in mind. But I wanted to put them to the test myself. 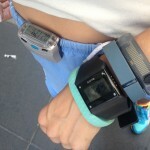 I wore a Timex hip pedometer ($30) while wearing all four bands on my wrist. I was completely decked out and utterly dorktastic. I mapped out a mile in my neighborhood, using Google Maps, RunKeeper data and also the pedometer’s mileage gauge. I did this walk almost every day for a week, comparing each band’s calculations at the start and finish of the mile. 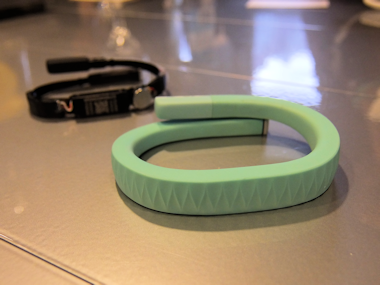 For short-term activity tracking, the Jawbone Up and Fitbit Flex tended to be the most accurate. The Nike+ FuelBand and Basis Band were more consistently on the conservative side, and the Basis Band sometimes gave some super-low readings. Here’s a sample day, with the pedometer registering 2,165 steps at one mile: The Up measured 2,166 steps, the Basis Band 2,157 steps, the Flex 2,140 steps, and the Nike+ FuelBand 2,076 steps. But on another test day, when I walked slightly over a mile, the pedometer registered 2,382 steps, the Up measured 2,339, the Flex 2,290, the FuelBand 2,103 and the Basis Band a bizarre 1,614. I also conducted a few whole-day tests, during which I was mostly working at my desk but also walked around the neighborhood, and found that all four bands registered more steps than the basic hip pedometer. In one such test, the pedometer registered 7,428 steps, while the Basis Band tracked 7,736 steps, the FuelBand measured 7,905 steps, the Up 8,369 steps and the Fitbit Flex 8,400 steps. That’s a lot of false positives, if you believe the hip pedometer. The Up and the Flex can be further calibrated for accuracy — you basically “tell” the band you’ve walked an exact distance and it adjusts your steps accordingly — but I didn’t notice a huge difference after I did this. One element of these bands I’m skeptical of is the sleep-tracking function. Up and Fitbit Flex use their respective accelerometers to measure your movement — tossing and turning or lack thereof — while you’re sleeping. Basis gets more technical, using both accelerometry and your heart rate. It had been a week of terrible sleep for me, and the bands recorded the gist of that — five hours here, six hours there. But Basis consistently showed that I was never interrupted during my sleep, which isn’t accurate, because I took a late phone call one night after going to bed. On my one great night of sleep, Up recorded that I got a solid eight hours, but that most of it was light sleep, which I found hard to believe. All of these bands claim to last several days on a single charge. In my experience, the Jawbone Up and Nike+ FuelBand have lasted the longest — almost a full 10 days. 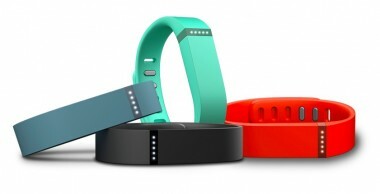 The Fitbit Flex gave the low-battery signal after six days. The Basis Band died that same night, while I was sleeping (which is impressive — considering that the Basis Band has a full display). I really liked having a heart-rate reading on my wrist all day with the Basis Band. And, as I said before, I like the Up’s design and mobile app. But my conclusion is that the Fitbit Flex is actually the best all-around band for your buck. It’s pretty accurate. Its wireless data-syncing is amazingly fast. It works with both iPhone and Android. It records sleep, if you’re into that, and it has a comprehensive food-tracking system. It’s comfortable, and it’s the least expensive at $100. I think activity trackers will be more precise in the near future, and some will actually include high-tech heart-rate sensors, and possibly displays. Until then, they’re a mixed bag. Just remember: You have to actually get up and move for them to work!